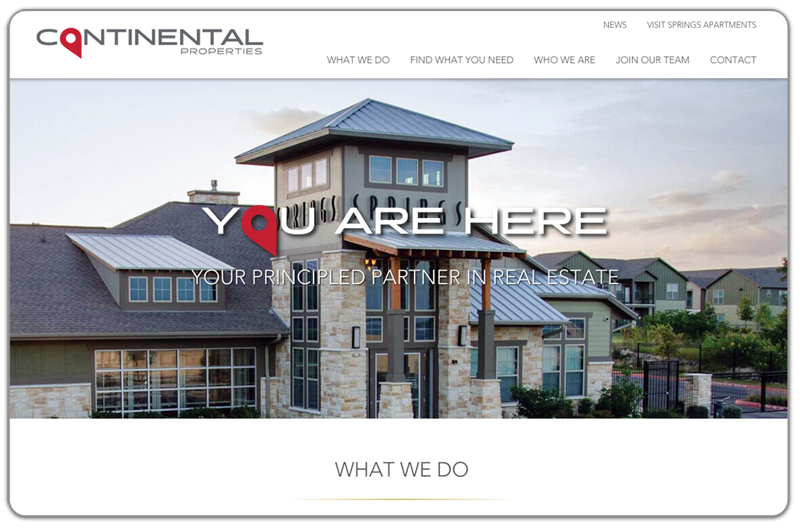 Continental Properties, a national commercial real estate development company headquartered in Menomonee Falls, WI, recently launched a new website built with the help of Weidert Group. Weidert Group designed and built the company’s website with the goal of attracting more relevant visitors and converting those visitors into contacts, and to present the company in a way that more accurately demonstrates its breadth of expertise and reputation as a national leader in apartment home, retail, and hospitality development. This also involved the development and introduction of a new logo to refresh the Continental brand. In addition to sophisticated project search functionality, the site features navigation that allows different audiences – future team members, financial partners, residents, retailers, and municipal partners – to quickly find the information they need. The site is built on the HubSpot COS website platform, making the website viewable specifically for different size devices and tailoring the user’s experience. You can visit Continental Properties' site at cproperties.com. Weidert Group, founded in 1981, is a full-service inbound marketing agency and a Platinum level HubSpot partner. HubSpot is the world’s leading marketing automation software, with more than 20,000 customers in 90 countries. Weidert Group provides all components of an effective inbound effort, including strategy and planning, web design, search engine optimization, content strategy and development, social media promotion, lead nurturing, sales enablement, and comprehensive program management. Clients represent business-to-business organizations in industrial equipment machinery manufacturing, financial services, insurance, A/E/C industrial services, industrial distribution and other industries.